When we discussed Hattie’s research (presented in his books “Visible Learning” and “Visible Leaning for Teachers“), we learned that well-planned and effectively managed classroom discussions can have a significant impact on the speed with which pupils grasp and assimilate knew concepts. This is not something easily achieved, and it takes a lot of practice for teacher’s to really master this. This page offers ten top tips designed to help speed up the process! What are the key ingredients of an effective class discussion? 1. You must have identified exactly what you hope to achieve by holding the discussion. 2. You will find it helps to have a good starting point for the discussion – a poem, a story, a piece of music, a film clip, some sort of prop, etc. Anecdotes can be highly effective. 3. Think through in advance how you might sequence questions which will help you to achieve your objective(s), but be prepared to let the discussion digress – provided the students remain engaged. Don’t be afraid to say “let’s come back to …” when the digression has run its course. The page on Progression explores the way in which the principles of Bloom’s taxonomy can be used to help you sequence learning effectively by using certain trigger words. 4. Try to take a back seat by bouncing the discussion around the room as much as possible. Dylan Williams explains how to do so in the short clip here. His advice really works. This Powerpoint posted on the TES website by Ross McGill, explores it in more detail. 5. Remember Growth Mindsets (see the page on Resilience) and comment on the good thinking shown by students even if they haven’t hit the nail on the head: e.g. “I like the way you linked that in with what A was saying?”, “I can see where you’re going with this – can anyone else take that point a step further?”, etc. 6. Use closed questions sparingly and try to drive discussion with open questions. 7. Encourage the students to ask the questions. Cultivate an atmosphere in which everyone must contribute – if they have no answer to give, then they must ask a question instead. 8. From time to time, re-examine the direction the conversation has taken: “Remember that after A agreed with B, pointing out that X, Y and Z were the case, C asked how certain we could be about Z, and that led to a really good point from D that …”, etc. Even better, ask the students to do this. 9. Try to make sure everyone contributes at some point, but never make the mistake of thinking that this requires you to direct simple closed questions at low ability students and challenging open questions at high ability students. It’s obvious you’re doing this, demeaning to the students, does nothing for their confidence and nothing for their learning. If any student is struggling to answer a question, and you’ve given them plenty of thinking time, try rewording it (or getting another student to), or break it down into smaller parts, or say you’ll come back to them later (and make sure you do). One effective tool to use here is the pot of lollipop sticks – another Dylan Williams idea. This has been used very successfully for some time in various departments at Loreto. You pose a question, or redirect it, or ask for clarification, and only then do you draw a lollipop from the pot to see whose name is on it, and who will therefore respond. You’ll be surprised at how well this keeps the students focussed (since they could be required to answer at any point), and at how happy they generally are to have a stab at whatever gets thrown their way, no matter what their level of ability. 10. Most importantly of all, be brave. Teachers often maintain too tight a control over discussions lest any lack of knowledge on their own part be exposed. Instead, we should use such moments as an opportunity to show that we all need answers from time to time, and to model ways in which they might be sought. See the post on Thunks for examples of simple generic questions which can get the class warmed up for a discussion-based exercise. 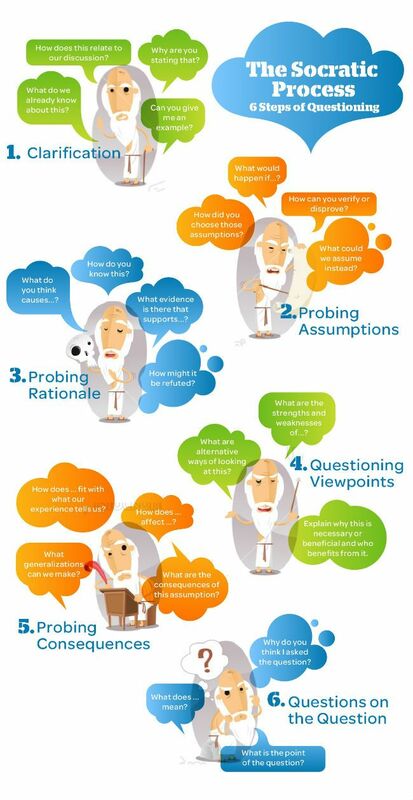 The Beaumont School Teaching and learning team have shared some great ideas on questioning here. Click on this link for a Guardian article on creative use of questions.